The humans inside looks like a virtual zoo, full of a wide variety of bacteria, a new study found. And scientists say that's a good thing. The first results of an international effort to catalog the millions of non-human genes inside people found about 170 different bacteria species thriving in the average person's digestive tract. The study also found that people with inflammatory bowel disease had fewer distinct species inside the gut. The findings are being published in Thursday's issue of the journal Nature. More than 99 % of the different types of genes in our bodies are not in fact human, but come from microbes. So cataloging the genetics of bacteria inside of us will improve vastly on the mapping of the human genome, study co-author Jun Wang, a Chinese genomics researcher believes. 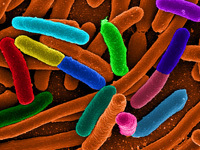 Bacteria "rule this planet, including our body," study co-author Jeroen Raes, a researcher at the European Molecular Biology Laboratory in Germany, said in an e-mail. "I think it's important that people realize that we are not really human — we are a walking colony of bacteria and they are crucial for our well being and health." Looking at 124 adults, researchers found that most people's digestive systems have a lot in common. At least 57 species of bacteria were present in just about everybody. Overall, the researchers cataloged about 1,000 different bacteria species and figure there's another 150 or so they haven't found. Researcher Jeffrey Gordon of Washington University, who wasn't involved in the study, called the work "remarkable and inspiring." He said it could lead to new understanding about human and microbial evolution. He studies the role of gut bacteria in obesity. Raes said medical studies usually ignore the influence of gut bacteria, but "this blueprint will allow us to study the role of the flora in many human diseases, such as Crohn's, diabetes, obesity and so on."